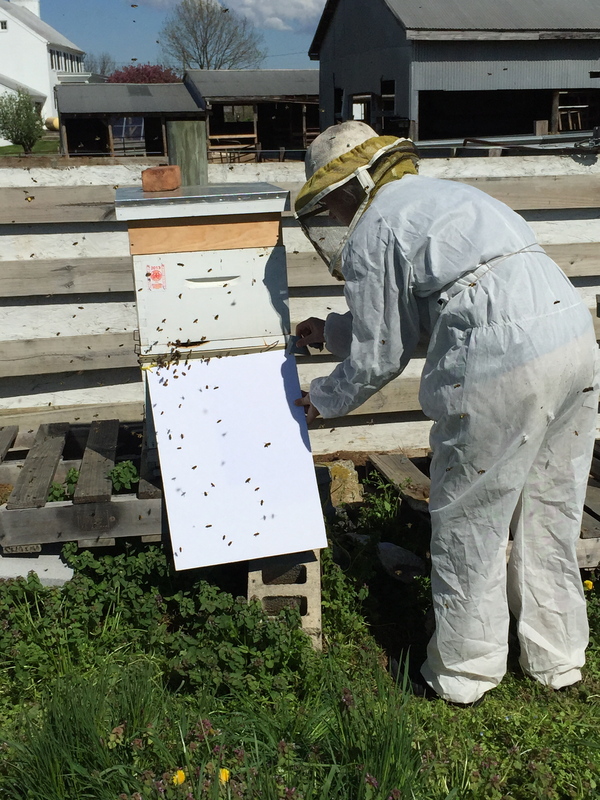 Q4 started a few days ago on the Garst Farm with the installation of the cloak board and the move of open brood to the topbox. Today, Liz and I rotated the hive 180 degrees so that the original opening is in the back (but still open). The queen is in the bottom box. We also put the cloak slider in, thus separating the upper box from the pheromones of the queen. 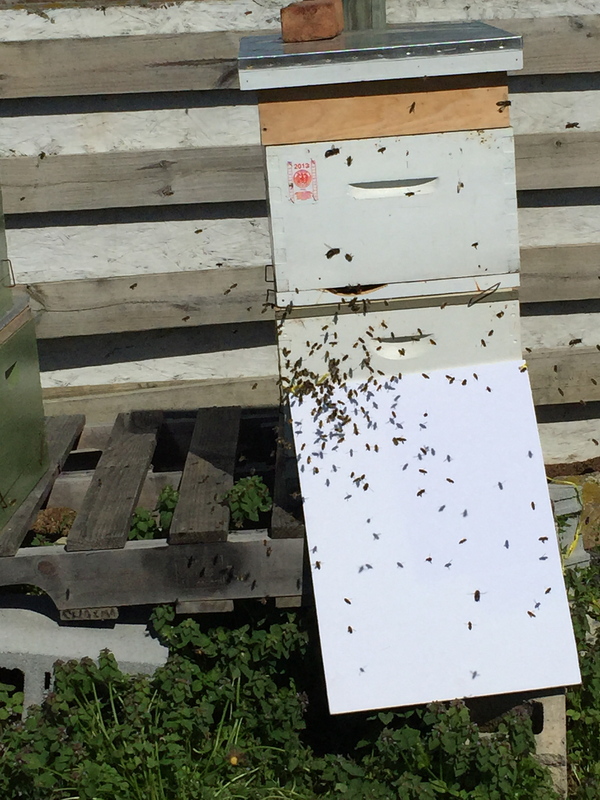 We then installed a ramp in front to the second story opening so that all the returning bees will crowd into the upper box. The crowding together with the lack of queen pheromone will instill a swarm instinct. Sadly for the upper bees, there are no larva young enough to start a queen cell from as the last brood went in on wednesday. Even if there were eggs in that, those will be too old for queen cells (but we should check regardless). Liz took some pictures, the ducttape is a bit distraction from the beauty of this setup, but ok. The bees were sure crowding into the upper box, which was not without bees to begin with. There are a couple of frames with emerging brood. Mel has offered a frame of eggs on Sunday, so we will graft about 20 cups and stick them into the upper box. There is syrup and a protein patty on the hive, just to keep everyone well supplied. For the cups, I, for the first time, dipped the cups into molten wax up to the lip and then pushed them into the bar. I will also give a few some royal jelly substitute, which I understand to be 1:1 plain yogurt and water. We have some new and some previously used cups, let’s see if that makes a difference. Tuesday afternoon, Liz will remove the cloak slider and then the bees will be re-united with the queen pheromone. Theoretically, that should put them from a swarming impulse to a supersedure impulse. And should get the bees to keep feeding the limited number of cells with copious amounts of royal jelly. Remember, they have very little other open brood to care for by that time, as most is capped over by then. They also should make nice long queen cells, utilizing the extra wax that they were supplied with. Let’s hope they all read that book too. Worst case: many big well fed queen cells torn down after removal of the cloak board. If anyone is available to help Liz on Tuesday, that would be nice. If you lift the feeder and peek into the hive to check the queen cell bar, we at least know what we had, even if we have nothing left later. I am hoping on Todd for this. The task is simple: lift feeder off, lift queen cup frame out, take picture, put back together gently. NO SMOKE. Smoke would be too disruptive. Next sunday, it is time to harvest. Kristien – you are the adventuresome one, aren’t you? I’ll help Liz on Tuesday if it can be after 2:30. Yogurt for royal jelly! Who knew? That would be great. Your job is to slide out the cloak board, close the rear entrance and lift the feeder off so that you can gently peek at the queen cell bar. Grafting went very well today, Mel gave us a near perfect frame to graft from. Plenty of larva, dark comb so that we could see the larva well and good glob of royal jelly to lift with the larva. Liz and I each did 10: 5 in old cups (reused, I am short on cups), 5 in new cups, 2 each pre-primed with ‘royal yoghurt’. Please take some pictures!! There was a gigantic queen cell on the frame that came out. The bees build that thing in a single day. A larva was floating on a 1/4 inch of royal jelly. Those bees must have been very desperate to start a queen cell, even if it was from this older larve. Unfortunately for them, we removed that frame. If they feed our cells as generously, we are in good shape.